Mon-Fri: 8 AM - 5 PM; After hours answering service. For over four decades, J.D. Smith has provided customers in Central Florida with comprehensive pest control services. Regular pest control treatment by a home pest control expert is the first line of defense against a destructive infestation. We are a certified pest control company experienced in protecting homeowners against rodents, termites, bugs, insects and other nuisance pests. Representatives are always informative and professional. We were happy with your service. You responded in a timely manner, technician was prompt and friendly. We recommend JD Smith to everyone. From polite Jessica who answered all of my questions over the phone to awesome Tony who came to my house and showed me exactly what would be done and put my mind at ease about my pets and plants to Ken who did such a great and thorough job, I will recommend JD to anyone. They were professional and so friendly it was like my family was doing the job for me. JD Smith Pest Control was professional, prompt, and affordable. I will be referring & utilizing their services for all my real estate clients. JDSmith has serviced my property for 15 years. No bugs in my house! Thank you for excellent on-time service. Have been a customer for more than 10 years. Very professional. No chit chat..just takes care of business protecting my home. Tim has been my service technician for many years. He is thorough and willingly addresses any problem I call to his attention. He also advises me of situations he observes and recommends an appropriate solution. As I am disabled he is always proactive in making the application of the chemicals with my limitations in mind. Along with being professional he is personable. I have been with JD Smith over 30years and I think that is more of a testament than anything. I have been a JD Smith for over 20 years as a commercial customer for a business I managed and my personal residence. My current tech, Thomas, is professional, efficient and always on time for my scheduled appointment. You are always on time and do a good job. JD Smith has done pest control services for me for the last 4-5 years. Their technicians are always on time, courteous, and have done an excellent job in keeping bugs out of my house. I have been a Termite Control customer of JD Smith for 30 years. They ( the techs) are very knowledgeable, honest, personable, and professional. I own a 1920 wood framed house so I need the best and they always deliver. The front office people are efficient and friendly and schedule me at my convenience. Top to Bottom.....a great local company. 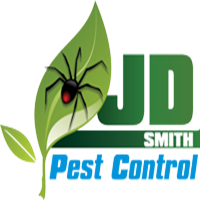 JD Smith is a great Pest Control Co. They have excellent customer relations! Tony Lavallo and JD Smith Company made a difficult process as easy as possible. They disseminated important information and supplies in a timely manner. Everyone was courteous and patient when I had questions or concerns. I highly recommend this company. I could not have received better service. I was treated like I would treat someone from my own family. Professional and phenomenal service. Highly recommend their services. Tony does a great and thorough job! THanks so much! We have been using this company for about 8 years and they always do a nice job. J D to everyone that has pest control needs . Thanks again Dave for ur past services. Tony did a great job explaining the service and approach. Our tech Steve was polite and professional explaining what he was doing as he was servicing. Tony was very knowlegeable and provided me a plan for future pest control and termite prevention with a transferable termite inspection and prevention plan as I am planning to buy my home in a few weeks. I am extremely pleased to meet with Tony and consult with JD a pest control in my years to come in Florida. Thanks for the high level of quality service . Awesome Company very through they do a fantastic inspection..this company is top notch. Our lawn was looking very poor and we couldn't keep ants out of our house, no matter what we tried. After 2 months, our lawn looks so much better and we have not noticed any ants in the house. If you have ants or moles, give them a call, you will not be disappointed. We are happy we chose JD Smith Pest Control for our lawn care company. They are courteous and prompt and do a great job. I was very happy with J.D. Smith Pest Control. I have used the company many years in the Tampa office as well Steven D. Howard & Shane was very helpful to us in the past and Jimmy Smith in the Clearwater office! Very good company. I recommend them with Five Stars! the person was very profetional. The tech David was very professional and very friendly. This is who we always call they are very reasonable on there prices. Have had service for termites for a year. Happy with everything they have provided especially the warranty and willingness to make everything right! Great customer service. Important to have a regular treatment in Florida to keep the crawlies at bay. I am very satisfied with your professionalism and integrity.I hope to contact you again in the near future concerning possible tenting. thank you. The inspector who came was very courteous and knowledgeable. We appreciate the excellent service!